High Potency Nano CBD Oil: 1,000 mg equivalent/btl. As the established leader in nano water technology, CBD Living, LLC has traditionally focused on the types of CBD products that are well-suited for nano CBD delivery systems and the most effective results from CBD therapies. As an author and publisher who has voluntarily and enthusiastically supported, personally tested and has reviewed their products for many years now, I was always surprised that they didn’t offer a nano enhanced CBD oil. Well they do now! CBD Living Daily Tincture oil... and I couldn’t be more thrilled for our Members who have been asking for it! Let’s face it, nano CBD oil is regenerating interest in sublingual, CBD oil in a tincture bottle. CBD Living Daily Tincture’s characteristics are very unique and immediately noticeable compared to other nano enhanced hemp oil products using older liposomal and colloidal technologies. t is designed with severe chronic pain sufferers and psychological anxiety/stress conditions in mind offering some of the highest doses of CBD obtainable at this point at 1,000 mg per 1 fl. oz. bottle. Each bottle comes with typical dropper-squeeze tops for a measured dose of 1 mg. of nano CBD. And for those that want to boost their orders with another 500 mg of nano CBD, check out my Product Review for CBD Living Crystalline Isolate. You simply add the CBD Crystalline Isolate (no taste) to the Tincture 1000 which brings it up to 1500 mg per bottle. CBD Living Tincture oil is clear and completely void of color which visually demonstrates the pharmaceutical level quality compared to other oils which contain all kinds of remnant organic particulates which may or may not provide a benefit. It definitely has a very subtle flavor, but it’s almost flavorless compared to the “hemp breath” and lingering aftertaste of most CBD oils and Hemp oils. Since the 1960’s, nanoscience has made an immeasurable impact on nanotechnology and the direction it has subsequently taken. After the invention of the scanning-tunneling microscope in the 1980’s nano scientists became able to more closely examine and understand the interactions of the nano particles created. Among all the news today about nano-sized devices and microchips which are so commonplace in consumer products and electronics (nano-electronic engineering), “nanotechnology” has also become the leading edge in pharmaceutical products. You’ll notice more and more information via products to which you are introduced that utilize nanotechnology. The reason for this is that the extremely small, nano-sized particles in medications and essential supplements are 9 to 10 times more effective due to its 100% bioavailability. As in the case with cannabidiol (CBD), nothing is lost to the digestive and filtering organs in our bodies. More effective dosing means that it is also more economical based on the amount of CBD actually delivered at the individual cell level. For those of you who are interested in a deeper dive into CBD and Nanotechnology, please refer to this pillar post on the subject. As I explain in my article “Cannabis and Endocannabinoid System”, I describe the 3 basic components to our ECS, and explain that it is a modulatory system that has been critical to balancing our central and peripheral nervous systems to the degree that chronic pain, anxiety and stress can be treated naturally, without toxic effects from prescription drugs. Our endocannabinoid systems produce substances almost identical to CBD, and the same CB1 and CB2 receptors cells located throughout our bodies. These receptor cells will accept any amount of CBD necessary or otherwise bioavailable, and only to the degree that it is needed by the trillions of cells that make up our body. Perhaps you’ve heard about “The Bliss Molecule” anandamide? Well, it was discovered by the same guy that discovered the human ECS and identified the healing properties of CBD and THC, Dr. Rafael Mechoulam (plus VIDEO). He also proved that anandamide engages (“docks up”) with CB1 receptor cells to regulate the homeostasis (balance) within various body systems like immune, hormone, cardio-vascular, and nervous systems. The take-away here is that without CBD, you are depending on that which your body manufactures on its own. So, when your body is submitted to increasing amounts of stress or disease, you may find that only CBD in nano form can return your body more towards a more normal and healthy balance. As I’ve become more educated on liposomal, colloidal, micelle, and nano structures utilized in CBD oil manufacturing, I’ve come to understand the differences between many of the popular CBD brands that claim to offer the best nano enhanced hemp oil. The first thing to understand as a consumer, or appreciate anyway, is that CBD is very difficult to work with from the standpoint of biochemical product stability. This has made it difficult to duplicate nano CBD oil products exactly and consistently from batch to batch (especially in water). Add in the complexities of “current good manufacturing practice” (CGMP), and the challenges for most all CBD oil manufacturers expand farther than they are capable of, or willing to go. The reason scientists, and now manufacturers, are so attracted to this technology comes from the beneficial results. These extremely small, nano-sized particles in medications and essential dietary supplements have been described as being 5 to 10 times more effective than typical form organics. This dramatic increase in effectiveness is because the actual molecules are reduced in the lab to over one-millionth of its original molecular size. At this size literally all of the CBD becomes 100% bioavailable to our bodies (and pets). As in the case with cannabidiol (CBD), nothing is lost to the digestive and filtering organs in our bodies. More effective dosing means that it is also more economical based on the amount of CDN actually delivered at the individual cell level. When you read that a CBD product is “water-soluble”, it is an example of misleading and inaccurate advertising or journalism. Even the finest nano CBD molecules produced are NOT water-soluble. In layman’s terms, the best of nano CBD particles are reduced in size to approximately one-millionth of their original, organic size... and then, encapsulated in a colloidal micelle structure which remains in solution – even in water. Nano CBD in an oil base is much less complicated for a CBD oil manufacturer to produce and therefore less expensive to provide because both cannabidiol (CBD) and base oils are “oil-based” substances. Adding nano CBD to a base oil like MCT (multi-chain-triglyceride) is likewise less complicated, the nano-CBD-emulsion component notwithstanding. So therefore, many forms and products are more bioavailable (effective) than others. CBD Living’s proprietary and patent pending process for nano-sizing CBD in a pharmaceutical grade CBD oil tincture product provides 100% bioavailability and immediate absorption. CBD Living company claims that their tests show a 9X or higher absorption rates compared to a standard CBD hemp oil tincture product. CBD Living Daily Tincture’s oil is tested to be void of not only pesticides and herbicides, but is certified as having any heavy metals removed as well. Only pharmaceutical grade MCT oil (medium chain triglyceride) derived from MCT fractured coconut oil is used as a base oil in CBD Living Daily Tincture. No VG (vegetable glycerin), or PG (propylene glycol) is added. Since the CBD oil is intended to be applied under the tongue, the nano-sizing of the oil absorbs much faster and more efficiently in your mouth’s tissues while what remainder is relegated to the digestive tract where again, the nano CBD clusters are also absorbed more efficiently than a standard hemp oil. Each bottle of CBD Living Daily Tincture contains 1 fl. oz. (30 ml) of nano enhanced CBD oil. Each full squeeze of the dropper will draw approximately 1 ml of oil from the 30 ml bottle. This equates to a daily dose of CBD for 30 days. The 1,000 mg size that we offer at Cannabis Animus is designed for people who truly NEED the strongest nano CBD oil that they can buy. Compare to other brands that only offer lower potencies (by volume) at 125 mg to 500 mg equivalents of nano CBD. If you want to increase the dose to 1,500 mg, just add a package of CBD Living Isolate to the oil. Medical doses used in 100's of clinical trials all over the world typically use 50 - 60mg per dose. So, that's twice as much as the aforementioned "daily dose". Please realize that these are considered standard adult doses by myself and CBD Living, LLC. As you may have already learned from personal experience, everyone responds differently to the same CBD product. And different products will produce different levels of results. As of this writing, I have been taking the CBD Living Daily Tincture in 1,000 mg per bottle or exactly 30 days. This has delivered approximately 33 mg of CBD equivalent compared to my usual 25 mg equivalent dose from my bottle of CBD Living Water (16.9 fl. oz). I’ve noticed that they both begin to take effect for my conditions within 5 minutes of applying either under tongue, or consumed/drank like my nano CBD water. However, I do believe that both the chronic pain relief (mine is osteoarthritis) and stress relief effects (and anxiety issues) lasts longer with the tincture. I still prefer the water when I’m hydrating during and /or after sports activities. Hands down, I go for the nano CBD Living Water. That said, CBD Living’s new, nano enhanced hemp oil tincture product is just as powerful as their premier product – which I think deserves high recognition. Without any hesitation, I can say that my experience with this product for the last 30 days has delivered far superior results to any other nano CBD or hemp oil brand. Not all CBD is created equal because not all CBD is manufactured the same. Nano CBD is completely used by the body, regardless of dosage, in 6 – 8 hours with diminishing residual effects following every hour after. Therefore, re-dosing may be advised based on your unique condition. You decide. If you are not getting enough relief, then double your dosage. Generally speaking, nano CBD is about 10X as effective as most non-nano-sized CBD products. Some people (and pets) require higher doses of CBD for the optimal effect to be achieved – regardless of their body weight (or pet’s weight). I sincerely hope that you have learned more about nano-enhanced CBD Hemp oil, and why it has become the focus of state-of-the-art CBD delivery systems. Does this help? UPDATE: I recently had a blood test to check my cholesterol, 2 years ago I was at 205, the day after Thanksgiving I had a blood test & the results were amazing! My total cholesterol is now at 173! I was so surprised since I hadn’t really been doing anything different except I’m now using CBD oil daily!! Another reason to keep up my daily CBD oil regimen! CBD Oil – CBD Living Tincture | Product Review is kinda vanilla. Thanks for the feedback Trent. Perhaps I’m guilty of too much focus on SEO. I know users would agree with you, however, search engines like Google won’t rank my articles and product reviews without adherence to the realities of their ranking algorithms. It’s a ‘dance’ to say the least, and that’s the art! After all, if nobody sees the article’s SERP Title & Description in their search… then what difference does a flashy title make? I am amazed how well this oil has worked for my pain! I was taking anti-inflammatories every 4 hours to try & manage pain. After only a few weeks of taking this oil on a daily basis I’m not taking anti-inflammatories! A plus side is my knees aren’t bothering me either! And thanks for spending quality time calling me for a bit of guidance along the way. Nano CBD is 5 to 10 times better than your typical CBD isolate + MCT oil, yes? I’ve found in my testing almost 100 CBD products that this particular oil is far superior to even other nano oils. 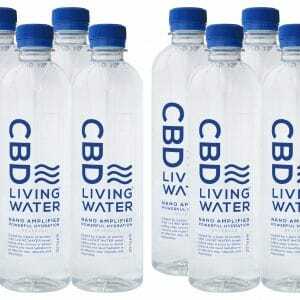 Wait till you try CBD Living Water! That will open you up to ultra hydration with B-12, d-Ribose, CoQ10 and nano CBD clustered in 7.4pH water molecule clusters that hold it in the most stable and effective solution ever achieved in modern biochemistry. I am a longtime member, and I’ve been using the CBD Pure 600 mg tincture oil. I switched to the CBD Living Daily Tincture (1,000 mg) nano oil. I will repost my results in a few more weeks after a 30 period. Thanks, and looking forward to sharing my results. That’s great Kaye! As you know, this is only a few month’s new as a product Review and available here at Cannabis Animus. Can’t wait to hear about your comparison. Thank you!